Superman: Sorry, you two! Normally, I'm all for "freedom of choice" and "do whatever makes you happy as long as it's not hurting anyone"...but you two are just too #$%^ing ugly to make babies. I know pronounce you Mr & Mrs Batman you may shriek the wife. Superman (thinking): Actually, this is less disgusting than the time Lana and I consummated our relationship. Superman to self: First I consummated with Lana. Then I get involved with the Fantastic Four. Now I'm in the Fly 3. Note to self, fire Thall. That's not nice! I don't even get paid to do this gig! My only satisfaction comes from tormenting you guys so... Oh, I guess that IS compensation. Never mind. 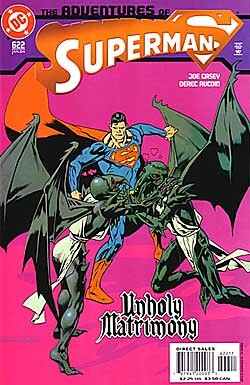 Superman: I now pronounce you Ugly and Ugly. You may now get out of my sight before I puke on your heads. Okay, yeah... I guess Chuck Austen wasn't that bad. I refust to comment based soley on the fact that the sight of this cover brings back memories of trama that I spent thousands of dollars on therapy to repress. Thank goodness that guy got fired! Kem: That's for being ugly. Kem: That's for being in a Joe Casey book. Thrall: Hey guys. Who milked the tractor this week? Kem: That's for saying "milk" and "tractor" in the same sentence. Kem: That's for getting too close to that guy. Kem-L raises his arm, but is incarcerated by a beam of heat vision. Kem-L is then magically revived. So I can smack him with my magic baseball bat. Get my last name wrong, will ya? I'll teach ya... Eat yogurt sock! Kem: That's for showing up every other week in the caption picture! Kem: That's for making delicious cookies in your magical treehouse! Sneakymonkey: Gee, Kem-L, you sure are kinda violent! Kem: That's for using me in your caption! Oh, you did NOT just diss the F4. This means WAR. The weapon will be comic geekdom. We meet at dawn. Come alone. Superman: Hey... Hey! Now, you two behave! I know what they say about prom night, which is why your parents asked me to chaperone. There will be NO procreating tonight, hear? *slaps their hands down from grabbing one another* NO! You can HOLD HANDS and that's IT. No hugging, kissing, or whatever it is you do... HEY! Superman: Now, now! There will be plenty of time to maul each other on the honeymoon, you crazy kids! Hey! It's Paris Hilton without makeup! BWAHAHAHAHAHAHAHA! That's classic! I've never heard the joke told better! ...No, I'm not sarcastic. Whatever gave you THAT idea? Superman: And finally, here's my gift for the newlyweds! Bug Bride: Oh, you should'n't have! Bug Bride: Hurry, open it up, dear! What is it? Superman: That's right, folks! Raid. Kills bug people dead. I'll stop there, for fear of Steve's wrath.